Awesome ending to an absorbing and captivating series. I listened to this whole series on audio, and it was awesomely done. 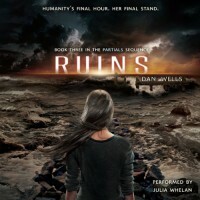 Especially the narration by Julia Whelan. Maybe I would feel differently about this series if I had read it instead. I'm not sure. I love all the characters in this series. While Marcus is probably my favorite, because no one does comic relief quite like him. I also love Samm too, he is just so damn sweet and lovable. I feel the best man won Kira's love in the end.